I may have had blue jelly bean teeth and a slight raspberry juice mustache on the night drive tonight. It really does pay to look in mirrors before leaving the house. Fortunately the moon is still gone and it was extra dark. Our drive tonight started with a Verreaux’s Eagle Owl- an exceptionally huge owl with pretty pink eyelids. It’s fairly common here but not something we see often. 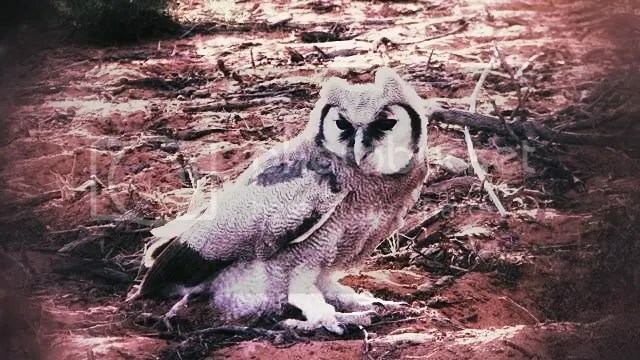 This Owl is a serious hunter, often killing other birds such as raptors and the very rare Pel’s Fishing Owl. It’ll even hunts Flamingos in other parts of the Kalahari! June 17: Are Springhares Hysterically Funny? Yes. Yes They Are.